Albendazole (a component of the drug) has broad-spectrum antihelmintic effect. It is effective against mono- and polyinvasions, imagoes and larvas of roundworms, trematodes, as well as against cestode imagoes. Ovocidic action of this active ingredient allows to lower contamination of pastures by worm eggs. 1 tablet contains albendazole – 0.36 g (as an active ingredient), as well as excipients. 1 g of granules contains albendazole – 0.2 g (as an active ingredient), as well as excipients. pulmonary nematodosis (dictyocaulosis, protostrongilosis, mulleriosis, cystocaulosis, neostrongilosis, metastrongilosis); cestodiasis (monieziasis, avitellinosis, thysanieziosis, goose and duck hymenolepiasis, goose drepanidoteniasis); trematodiasis (fasciolasis, dicroceliasis, paramphistomidosis). 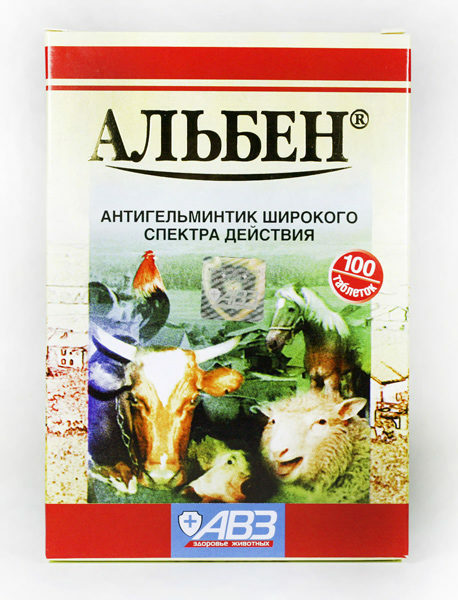 Do not use during lay period; in the first half (sheep, goats, pigs and carnivorous animals) and first trimester (cows and mares) of pregnancy; in contagious and debilitated animals. Alben granules – 1 kg polymeric bucket, 0.5 kg multilayer paper bag. Alben tablets – box (100 tablets). Store in closed original package. Protect from light and moisture. Keep out of the reach of children. Store separately from food and animal feeding at 0-25°С. Farm animals and poultry are allowed to be slaughtered for meat in 20 and 5 days, respectively, after deworming. Milk is esculent not earlier than 4 days after deworming. Eggs are esculent in 4 days after deworming. Meat of compulsorily slaughtered animals and milk received before stated period termination can be used to feed carnivorous animals. Esculent fish is allowed to be caught and sold not earlier than 18 days after termination of the drug administration. Water temperature must be above 8°С.